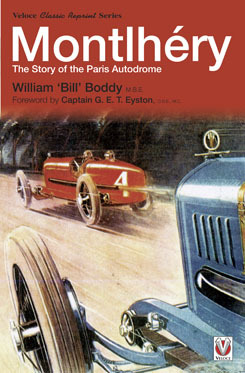 Montlhéry - The Story of the Paris Autodrome, by William "Bill" Boddy. Published by Veloce Publishing Ltd, 33 Trinity Street, Dorchester, Dorset, England, DT1 1TT. Tel: +(0)1305 260068. Fax +(0)1305 268864. (1) A list of facts. 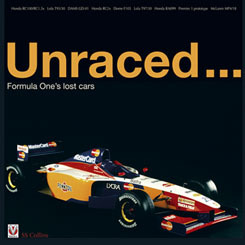 An example of this can be seen in the February 2007 issue of Motorsport. This kind of writing lists in long paragraph who won what at what speed, and is great for technical accuracy and for gleaning the results, but is not very readable as it doesn't flow. I call this his writing to a deadline. (2) Excessively long sentence writing. In this, sentences have a myriad of commas and go on for ages. There is nothing wrong with the English, and I can't criticise the grammar, but I find this style hard going. (3) Boddy is really interested. In this style, the above two styles disappear and you are led on tales of what happened, and who would be involved. So, which would this book use? It was promising when reading the foreward by Captain G.E.T.Eyston, racing driver and speed record holder from the 1930s. It got better when reading the introduction - Boddy was interested. It made the book a good read, with only a few deadline paragraphs here and there. The book details the races which took place, the various record attempts made, as well as describing the more unusual cars which took part in detail, and couples this with pictures which enhance the text. As a book which describes the history of a circuit, you couldn't ask for much more. There are a couple of minor errata, but nothing to detract from the overall flow, except for the replacement of the letter "i" with "l" at various points in the book - wlth, thls and natlonal being examples. The book is a reprint of a book first published in 1961 and long out of print, with an addendum to bring the story uptodate. Making the book available again is great, bringing to a new audience a story and results rarely heard. What is slightly disappointing is the update. The update effectively finishes at the year 1971, yet as late as May 1995 the Montlhery 1000 km was being held (it was won Stefan Oberndorfer and Detlef Hubner in a Porsche). The update also gets weaker on details as it gets closer to the end date of 1973, these years being of less interest to the author. There is also one minor point in chapter 1 which needs correcting - it says that in 1909 America built a "slightly banked brick circuit" at Indianapolis. In 1909 the circuit was indeed built, but the surface was made from crushed stone and tar. It was only because the circuit broke up too badly in the first race meetings that the track was relaid with bricks. In summary, it's a great book which would otherwise to be difficult to get hold of. It's just that the update could have been done better. PG 39 - Says that 172 km is 199.62 miles - should be 106.87 miles. PG 46 - Says that the Renault covered 3589.41 miles at an average speed of 107.9 mph in a 24 hour record attempt. The figures do not compute - if the average speed is 107.9 mph, then the distance should be 2589.41 miles. The book said that the original distance would be the same as a straight line between London and Baghdad. The new distance would be London and Ankara. PG 50 - Says first sentence, second paragraph "for cars up to 200cc". That should read for cars up to 2000cc. PG 54 - Second placed Chiron in the Formula Libre race: time is incorrect (printed time is 1h02m05s, a faster time than 1st placed Divo). Should be 1h02m52.2. PG 69 - Says "Leon Duray then went to work, going first to that piece of public road at Arpajon which the French were able to close for racing, to attack the 1/2 litre ss kilometre record with his Packard Cable Special, then returning to Montlhery to break records up to ten kilometres with a 1/2 litre Miller at over 139 mph, and up to ten miles at 135.33 mph.". This is incorrect - Duray came to Europe with two Millers, one at 1.5 litres and one at 2.0 litres, and both were known as Packard Cable Specials. He didn't drive any 1/2 litre cars. PG 95 - "the 1000 kilometre at 156.283 mph" should read "the 1000 kilometre at 156.283 kph". PG 98 - Says that the Citroen completed "the 10000 kilometres at 114.04 mph" - should read "114.04 kph". PG 130 - Says "in addition the Napier-Railton secured the Class A 1000 mile record at 121.51 mph" - this should read the 1000 KM record, as the 1000 mile record was at 122.82 mph and is given earlier in the paragraph. PG 157 & 164 - The driver referred to as Girard Cabantous is infact Yves Giraud-Cabantous. PG 223 - Joe Bonnier should be Jo Bonnier, as Jo is short for Joakim. Unraced... Formula One's Lost Cars, by Sam Collins. E-mail: sales@veloce.co.uk. www.veloce.co.uk. This book is a nicely produced book with lots of crisp images showing lots of detail about the cars it covers. But we need to get one thing out of the way first - the title. The cars covered in the book are exclusively from the 1990s and early 2000s, whereas Formula 1 as a World Championship goes back to 1950. Given the title, I would have liked to have seen cars like the Kieft, Cosworth 4WD and Williams 6-wheeler covered. Perhaps this book could be volume 1 in a series of books covering the different eras? This one is a nice start for the era it covers. Autosport magazine claimed in their review that a lot of the information in the book could be obtained by reading magazines from the time. Having read the book, and having got a copy of every single Autosport magazine since October 1992, I can see their point - where Autosport covered projects in detail, the same information is available. But although it is a successful and internationally recognised magazine, it only sells tens of thousands of copies per week. There are millions of Formula 1 fans in the UK alone, so Autosport is only read by less than 10% of the available fan base in the UK. A large number of those won't keep every issue when they have finished - 15 years worth of magazines takes up a lot of space! So that's a lot of people who won't have the information available to them. There will also be a lot of people who were born at the beginning of the 1990s who wouldn't have had the chance to buy those magazines - this book would make an ideal present for one of them. It would be a lot quicker than taking the time to look through all of the magazines too - I know, I've done it in the past. There are some interesting stories to be read in the book, with comments from the people involved. Inevitably some stories are told in more detail than others, depending on the availability of people willing to speak out. But overall there is plenty of details on the cars covered, with detailed technical photos which allow you to see the various features of the cars. There are some minor niggles, for instance, at the end of the Dome chapter, it ends somewhat abruptly in the middle of a sentence - what was Tadaki Sasaki saying about Dome? Also, after an interesting section on Honda's record attempt at Bonneville, describing the problems that they faced, it mentions that the record they were after was achieved, but doesn't say what they raised the record to. The pages per pound ratio is also a little low, but then that is to be expected from a book with such a large number of high definition colour images. These things do not detract from the overall book though. The Last Works Minis - The End of a Legend, by Bryan Purves & Tim Brenchley. ISBN: 978-10845840-87-7, �.99 (+ P&P). E-mail: sales@veloce.co.uk. www.veloce.co.uk. Works Mini's - it's one of the most evocative themes of rallying. Mention the Mini, and it brings to mind the Monte Carlo Rally in the 1960s. Who can forget the images of Mini's decked out in rally spot lamps in the snow, a shivering driver huddled behind the windscreen, trying the beat the route, the weather and the vagaries of the judges? This book isn't about that. It does mention the Monte Carlo rally, and some of the drivers are even the same. It's just that the time is wrong. The book covers the Monte Carlo and RAC Rallies between 1994 and 1996, and does so with a huge number of pictures. I'm not a Mini enthusiast, but I could still enjoy the book and the story, although a Mini enthusiast would appreciate the detailed parts lists and details of Group A upgrades more. There are so many technical pictures and parts lists that if given a Mini in component form I could have a very good go at building one! I've rarely seen such detailed coverage of a rally as is done for the 1994 Monte Carlo and RAC rallies in this book, with stage maps, copies of official pace notes, and a detailed following of the involved Mini crews. That these two rallies were covered so well only highlights the much lighter coverage of the 1995 versions of the rallies. If they could have been done to the same level of detail, the book would have been perfect! 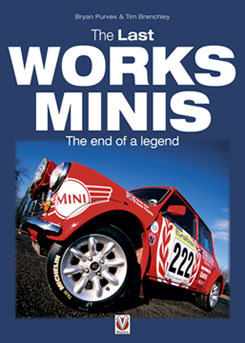 As it is, the book is a perfect present for the Mini enthusiast.